Megan Anderson sees a big positive in Amanda Nunes’ victory over Cris Cyborg. In the co-main event of UFC 232, Nunes dethroned Cyborg to become the first female two-division champion in UFC history. It took Nunes just 51 seconds to earn the finish. It was a shocking end to Cyborg’s streak as she hadn’t lost since May 2005. “I think it’s good. 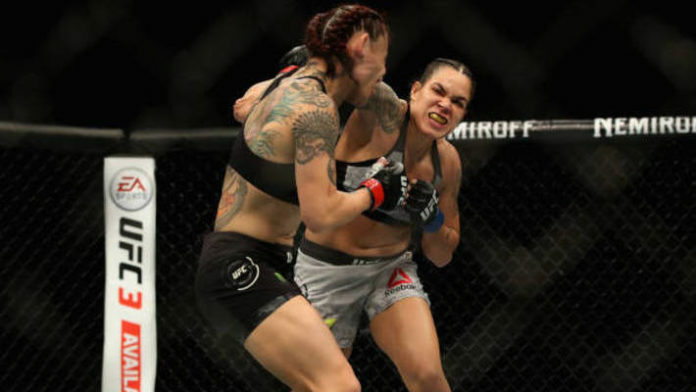 I think Cris’ — she was on like a 21-fight win streak or something like that — I think her invincibility is what made it hard for people to want to stay in this division because she was so dominant and I have believed for a while that if Cris was to lose or if she was to not fight anymore, I feel like the division would flourish. Anderson fought on the same night that Nunes made history. She took on Cat Zingano on the preliminary portion of UFC 232. Anderson threw a high kick and her toe caught the eye of Zingano early. Zingano stopped defending herself and the fight was stopped, giving Anderson her first UFC win. Do you think Cris Cyborg’s loss will lead to an increase in women’s featherweight contenders?